games | Apple pie, anyone? We are in Colorado right now, staying at a place called Oso… which we thought was pretty appropriate for a name. When your family is out of town, make sure you bring in an extra-special farm-sitter that is not afraid to take stealth photos of new baby calves. 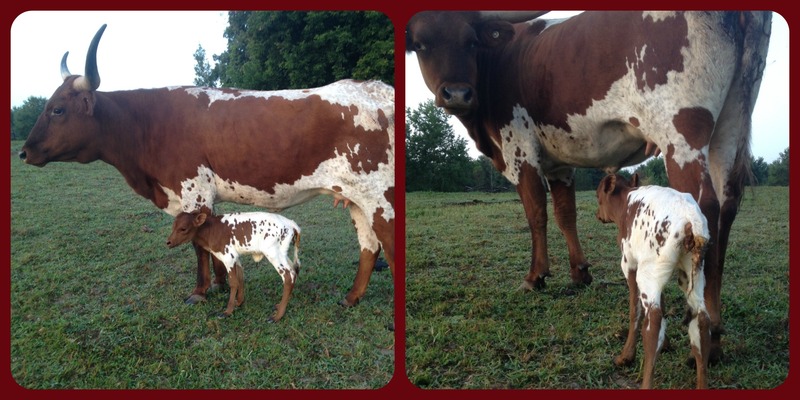 Safari had her first calf sometime last night, and we’re all pretty sure it’s a girl. Renae mentioned that Safari didn’t seemed bothered at all that she was taking photos of her rear for identification purposes. I, personally, would be completely offended. For those of you counting, that makes 7 boys and 2 girls this season. If you remember from this post, we took a poll as to what we thought the last three calves would be. We finished with 2 girls and 1 boy. There were 9 correct guesses (of those who left their name in a comment on the poll or in the blog comments). My niece grabbed AMBER’S name out of those winners… so you get a free shirt, Love! Just let me know what size. Hope y’all have a fabulous weekend! We leave out of here Saturday morning and will drive through the night back to Michigan. Prayers for safety and sanity always appreciated. …be completely not anything that is remotely normal in our case here at the farm. It’s Baby Time out here at TexasNorth! My favorite time. Sweet little calves running and hopping around the pasture… getting lost, getting found, sleeping half the day and growing the rest. I love it. IN GENERAL, the whole baby thing works itself out to be 50-50, ya know? Half girls, half boys. It’s pretty easy to keep track of cow pregnancy stuff… it’s very similar to human stuff. Females cycle every 21 days. The bull determines the gender. Gestation is 9 months and 2 weeks. I think we’ve talked about this before, but let me say again that breeders generally want more girls than boys. Girls have more babies. Boys… eat. The boys feed a lot of friends and family as super-lean beef, which is fantastic. But in order to expand and diversify the herd, it’s absolutely necessary to have girl calves. Heifers. If you don’t get heifers the natural way, the breeder has to pay cash for new mammas. That gets a little deep in the pockets, ya know? In our 5 years of breeding with 8 different bulls, we’ve had 55 calves. 13 of them have been girls. THIRTEEN. With our track record, we go into every calving season expecting boys. It’s just what we grow here. When a sweet little girl shows up every now and then, well, it’s pretty fun because it means we’ll finally get to keep one for awhile! 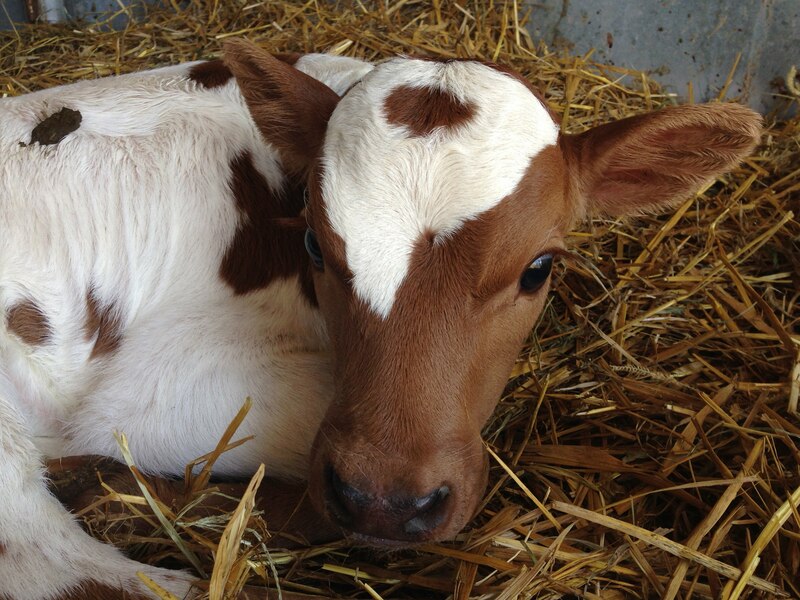 We’ve got 3 calves still waiting to make their grand entrance this summer from mammas Safari, Lindy, and Abigail. Let’s take a poll, shall we? What do you think they’ll have? If you’re like my Great Aunt Myrtle*, you need to see the belly before you can guess at gender. Here’s a picture of them from just last night, if that helps. What’s your best bet? Click the poll, certainly, but be sure to leave your guess in the comments. I’ll draw from the winners for a new TexasNorth tee-shirt. Now, if you’re not the betting type, I’ve got another option for you: you can buy your t-shirt outright. Imagine this thinner, soft as a cloud shirt (red tri-blend, 3.4oz, 50% poly, 25%cotton, 25% rayon) in a washed-out red with our sherif badge logo in white ink (just like the hoodies last year). AND, KID SIZES. You heard me. Both youth and adults shirts are $12 each. Of course I’ll mail it to you, but I’ll need a little extra cash for shipping. I’ll double check, but I think $5 on your whole order will do just fine. It’s unisex sizing. I can wear a medium or a small and will order a small. If you’re ready to commit, PLEASE EMAIL ME (katiemulder AT gmail DOT com) so I have all the orders in one spot and my brain doesn’t explode. Gracias. I’m off to do a rain dance. My children are all at the age where they require multiple outfits a day. Rylie is 5 and must change (everything) when a drop of water falls on her. Or, if she feels like it. Gideon is 2 and I’ll spare you the details. June Bug, at 4 months, regularly needs a change of outfit due to bodily malfunctions or siblings’ attempts to feed her. Or color her. I’m always on the lookout for garage sales. 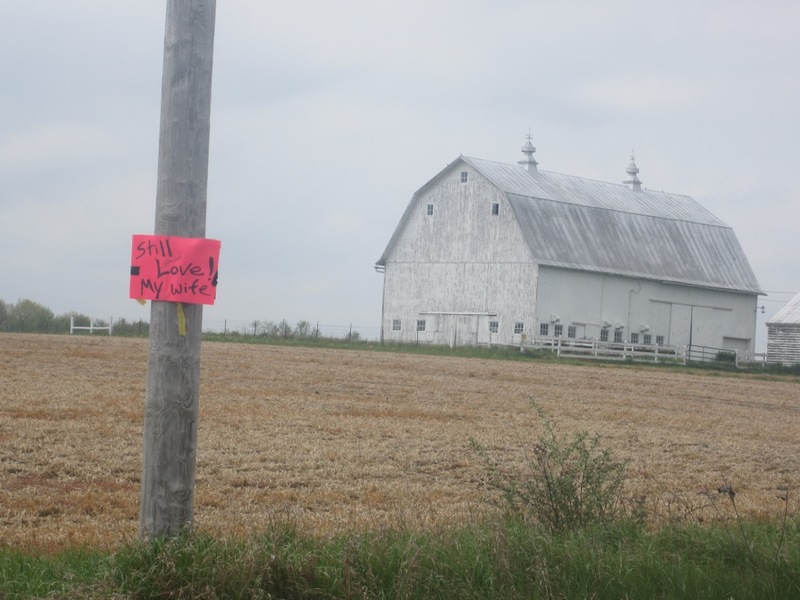 And, as everyone knows, the universal sign for Garage Sale is neon pink poster board stapled to a telephone pole. I spotted one from afar last week on my way home from errands. We had half an hour before Ry was due for pickup from school, so I thought perhaps the rest of us would do a little browsing. No garage sale, I guess. The next day, I noticed another sign about 100 yards past the first one. They keep going. 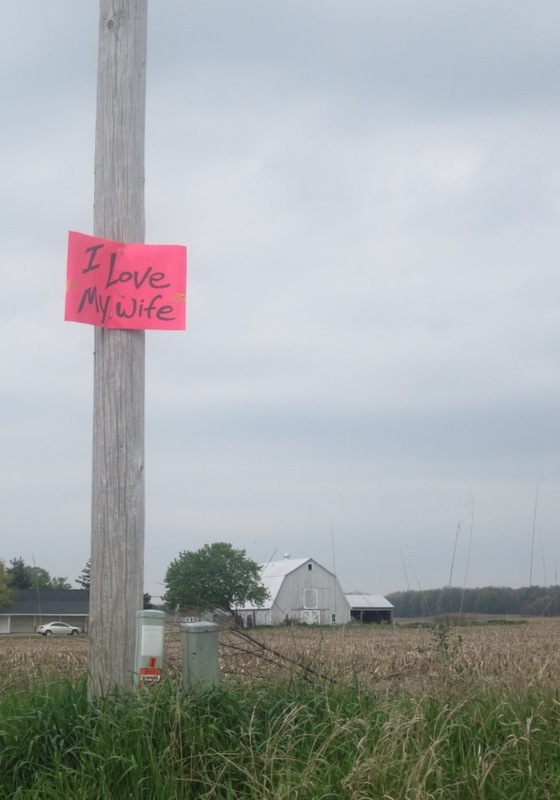 For about 5 miles, there are these neon pink signs stapled up to telephone poles on Belding Road. They talk about her smile and how she is kind and how he thinks she’s the greatest. We need more of this kind of greatness. Earlier this year, I played along with Molly as she mailed out a boomboom raok card to a bunch of readers and we all emailed back with our stories. I thought maybe we could do our own grass roots version here at TexasNorth. Maybe you and your family could help me come up with a bajillion activity ideas and I’ll make up a bajillion activity assignment cards and mail them out to a bajillion people and we’ll all play together but separately and our kids will think it’s awesome and our husbands will play with us and our neighbors will think we’re crazy and we’ll make some memories and everyone wins! The Kindness Project? You’ll help me? We’ll all put some KPs on our fridge this summer and go out like ninjas of fun and goodness? Maybe, through a bunch of small ideas, we could help each other be creative and kind and happy. I would so love that. Small and big activity ideas: GO. I declare an egg war. Grab a dozen eggs and hardboil them. Put eggs in a pan, cover with water. Turn the heat on high. set your timer for 8 minutes. and place them in a bowl of ice to cool. 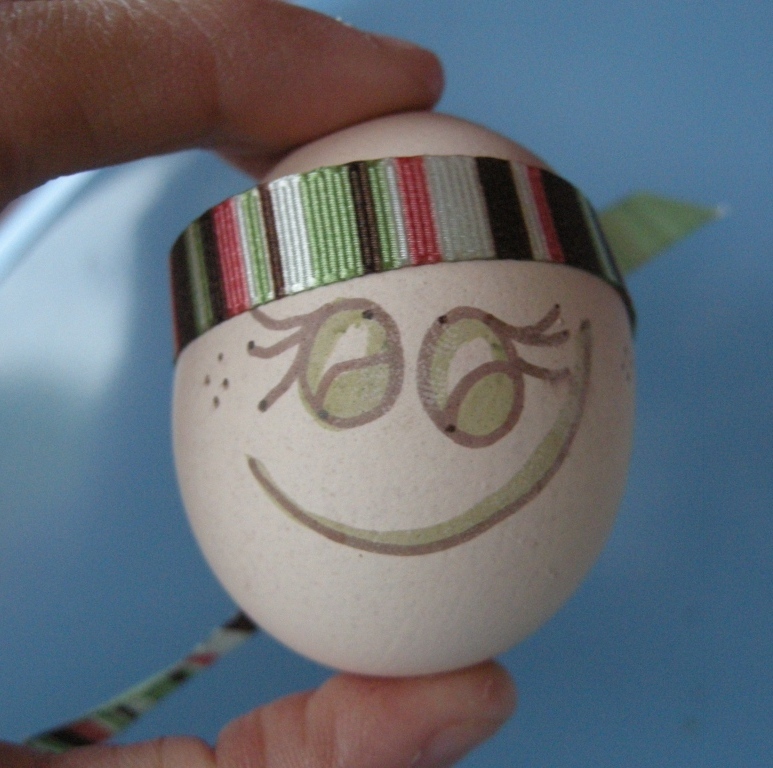 To start, everyone chooses one egg from their personal team and writes that egg’s moniker on a slip of paper. Those names go in a hat or bowl or bag, 2 names are drawn, and those 2 eggs go to battle. Let me say, as a decorated veteran of many an Egg War, there is absolutely NO advantage to either battlefield option or egg position. I have won and lost from all of them. Your family or group will undoubtedly decide one is better than the others and bank their fate upon it. Go with it. 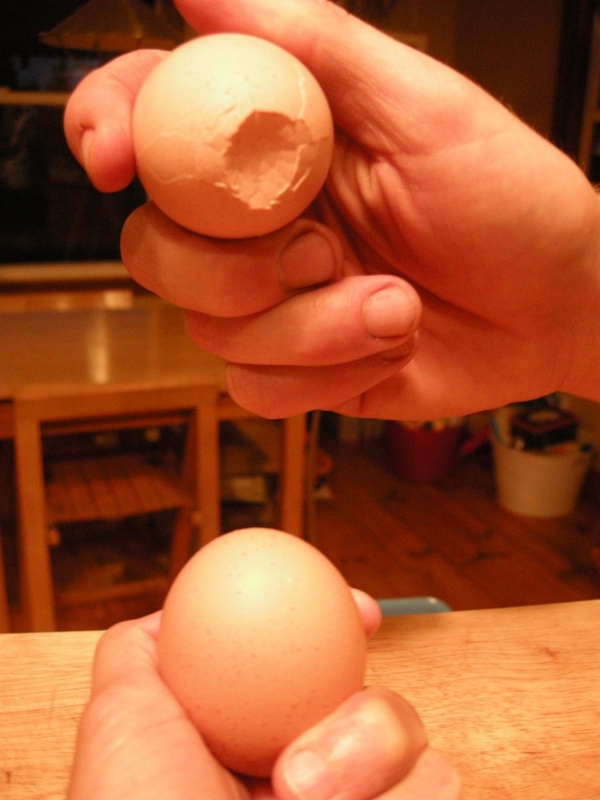 Warriors hold their eggs in their palm with the pointy side of the egg exposed for battle. 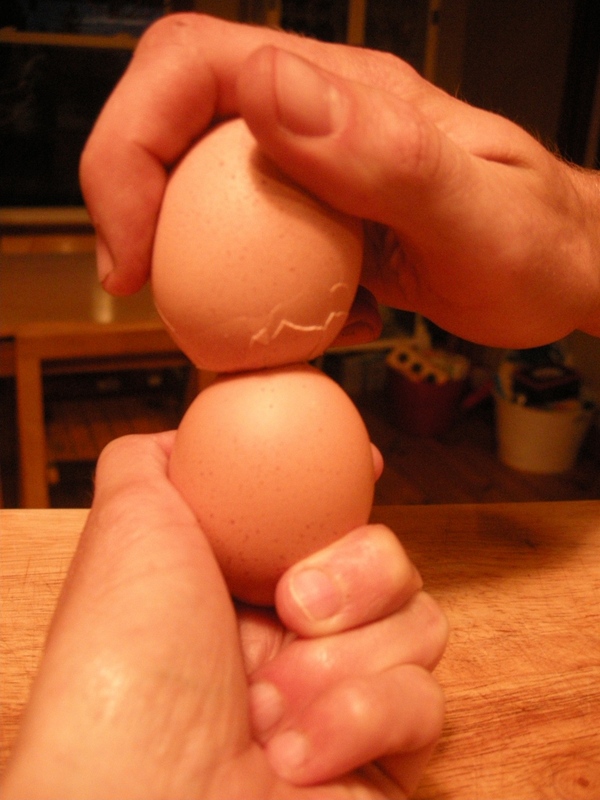 Eggs take their position, as determined by Options 1 or 2 explained above. 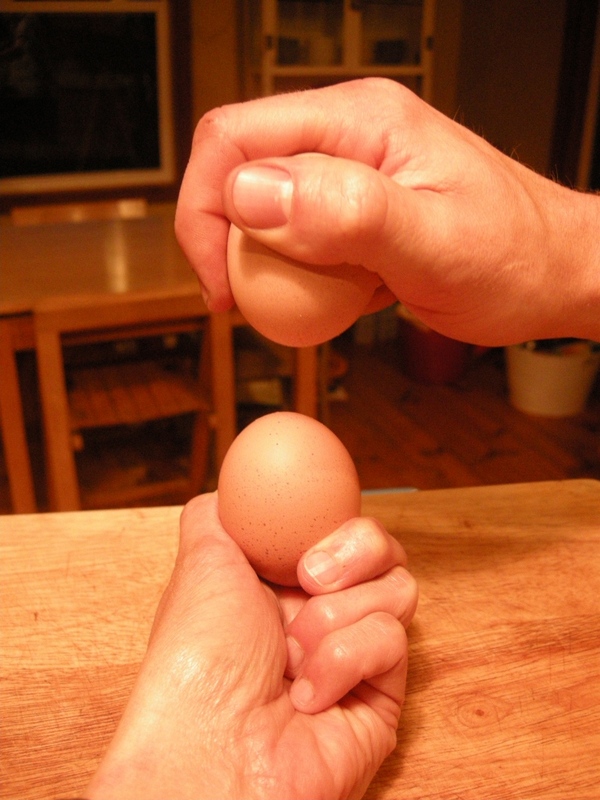 A referee gently counts 1, 2, 3… and the two eggs collide. Only one egg will crack. There is no science to this, I promise. Sometimes, harsh cracks gentle. Sometimes gentle cracks harsh. Sometimes, egg 1 wins from the ground. Sometimes, egg 2 wins from the air. There is no need for anyone to get a running start or drop their egg from 5 feet above their opponent… a few inches of initial separation is all that’s required. Sometimes, very rarely, both eggs will crack and warriors must call in a sub from their cartons for a rematch. Winners advance to the next round. Losers eat their cracked egg. You can play until all your eggs are defeated and there is one winner, or you can play one round at a time… saving the next round for the next Game Day, drawing it out and building the suspense. A final-four-ish bracket is super fun for keeping track of which eggs are destined for glory. This is a great game for campfires, family reunions, college groups, office co-workers, sprinkler days, rainy days, boring days, winter days, Fri-days, you name it. The magic is in the decorating, the friendly competition, and the silliness. I confess, I have never played this with children… only adults! Obviously, the Littles will love it as much as the Bigs. And she will destroy you.